Author, A. J. Llewellyn » IT’S TIKI TIME! AUTHOR SPOTLIGHT: D.B. McNICOL – WIN A FREE EBOOK! IT’S TIKI TIME! AUTHOR SPOTLIGHT: D.B. McNICOL – WIN A FREE EBOOK! Today we’re meeting the awesome D.B. McNicol, whose book, Paradise Down is an exciting, dramatic book in the dazzling Lei Crime Kindle World series! You can win a FREE copy of this gripping crime book by posting a comment here. This enters you into the draw to win! D.B. is a traveler…an adventuress you might say. She’s busy writing and exploring, but soooo cool she even stopped by to answer some totally stupid questions…how cool is that? 1. Aloha D.B! I have some truly important questions to ask. First of all, what is your favorite childhood book? My favorite childhood book – I had to think on this one. I think my all-time favorite was “Wind in the Willows”. It was the first hardcover book that was mine, given to me by an aunt and she signed it. I wish I still had it. My other favorite was actually a series. While most kids read “Nancy Drew”, I fell in love with “Trixie Beldon” and saved all my babysitting money so I could buy the books. 2. How did publishing change your writing habits? After publishing my first book in my Klondike mystery series, “Not a Whisper”, I quickly finished my second book, my only romance, “Home Again”. I learned I needed to allow two to three times the amount of time for edits and revisions that I spent on writing. I also learned I work much better with a deadline. The bulk of my first drafts in all three published books were written in NaNoWriMo style, one in thirty days. Since then, when I don’t write that way, it takes me months and months to produce a first draft. I had to laugh at this one. Right now it’s the sloth because that matches how quickly my latest WIP are getting written. Guess I need to choose a speedier mascot! 4. Any advice for your previous boss? Hmmm, this is tough. I haven’t had a full-time boss in almost twenty years. I retired from my IT career at age fifty, never knowing I would end up writing fiction. Or that after over thirty years of being a detailed analytical at work, I would love being a pantser when writing. Six people I’d want to be on a desert island with – for who knows how long. I’m terrible with conflict or drama in real life, so I’m afraid this would could be a boring choice for others. I would chose my best friend from junior/senior high school, my best friend from my work career, my husband who never fails to make me laugh and look at things differently (and usually from a better angle), my youngest brother for his sense of humor and everyday survival skills, and one close writing friend and his wife. I don’t know if any of us could cook very well, but we’d sure be entertaining.Fantasy castaway meal? Taking away food allergies, it would be lobster, corn on the cob and a Greek salad. Putting in a dose of reality, toss in Moose Tracks ice cream, cinnamon teddy bear candy chews and dark chocolate Hershey kisses. Aloha Nicholás! But will this be a hello or a goodbye?When Lucia Santerez returns home to Hawaii to help her brother Nicholás with his new dive shop, she learns Nicholás has disappeared–and someone doesn’t want him found. Enlisting the aid of hunky vacationing firefighter, Jared Stevens, gets them the wrong kind of attention. 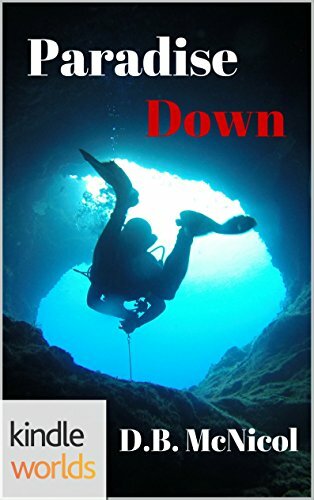 They discover what lies under the water off the coast of the Hawaiian island of Kaua`i could make you rich or get you killed. For readers of the Lei Crime series, this story occurs shortly after the Lei Crime Series book, “Fire Beach”. I think I was destined to be a writer – in the 4th grade I took my toy typewriter and painstakingly typed out the neighborhood news, one copy at a time, and sold it to the neighbors for ten cents each. But as often happens, life intervenes and writing took a back seat to spending 30+ years in the IT industry. A late in life lover of adventure, I learned to ride a motorcycle at age 55, traveled the US solo on my Harley-Davidson at age 58 (42 states and 27k miles), selling my home and everything I owned to become a full-time RVer. I eventually met my current husband, also widowed, a full-time RVer and Harley rider. Fate! We traveled the US for several years before putting it in storage and moving to Cuenca, Ecuador for two years. What at adventure! Now we are back and continue to travel in our 41′ fifth wheel toy hauler trailer. I continue to travel and write, savoring every moment of every day! Thanks so much, AJ. These were fun questions! Aloha 🙂 Wow, great interview. Sorry, I’m behind the eight ball. What a fabulous life you’ve lived Donna. 🙂 How amazing!! I enjoyed this a lot.